and in the flower department at Eli’s you’ll find all the usual suspects — daffodils, tulips, anemones and hyacinths, lilies and pansies galore. Easter lily, of course and any day now lily of the valley to celebrate the arrival of May. You also find pots and flats of herbs and annuals for the urban gardener. Lead horticulturist, Sarah Wright is there to answer questions and lead you to compelling combinations whether you are filling a vase, a pot or a planter or a window box. As a longtime Upper East Sider, I wanted to create a wine bar for my neighborhood where dinner would be a relaxed affair and the wines by the glass would be enough to return nightly. Today, Bar ’91 offers a rotating wine list and market-inspired menu perfect for any night of the week. The focus at Eli’s Table, the restaurant attached to and inspired by the market below, is seasonal yet, on weekends, the menu turns to the classic fare New Yorkers have come to expect from the name Zabar: smoked fish, the city’s best French Toast, and a bottomless bread basket, all served in a relaxed, family-centric setting. Open for dinner nightly, and weekends for brunch. Spring is in the air… at least in my head it is, where the worst of winter is behind us and we can start to dig out of hibernation. Citrus from California is still rolling in, as irresistible as candy, and ramps and rhubarb are coming along. The tomatoes in my greenhouses have started to climb, so we’re hoping for a mid-May harvest to hold us until summer starts sending us her sun-warmed treasures. Passover and Easter aren't til late April this year, which means you can enjoy spring lamb and spring flowers on your holiday table. 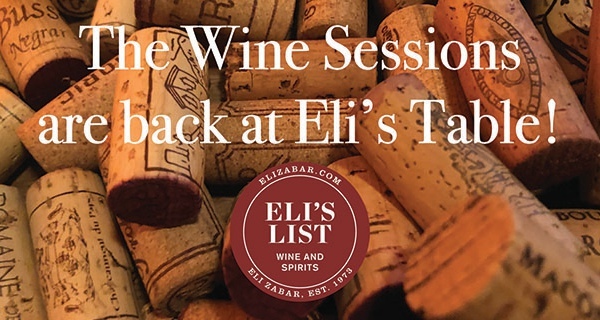 I’m especially proud of the selection of kosher-for-Passover wines we have to offer—they’re bright and tasty and hold their own against this traditional holiday menu.